This is the same 'Processional' that was written for English horn, French horn, and Piano but a Minneapolis harpist contacted me and requested that I arrange it for flute and harp. 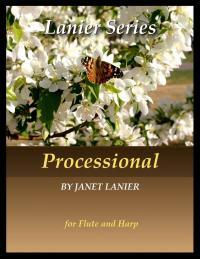 She said in her message, "This was a great day when I found your beautiful composition 'Processional'. Doing many weddings on the harp, this song would be a new melody to suggest to brides." Her idea was very appreciated. The piano part transcribed beautifully to the harp with only a few adjustments to fit the harpist hands better. There are no pedal changes in this piece and the individual harp part offered in addition to the full score is a great option for harpists who want to reduce the number of page turns. The two wind parts transcribed to the individual flute part with only a couple of phrases given to the harp.